Produced in cooperation with The Foundation for Evangelism, this book offers a Wesleyan evangelism through the lens and in the spirit of E. Stanley Jones. Contributors include Thomas R. Albin, Jeffrey Conklin-Miller, Robert E. Haynes, Jack Jackson, Joon-Sik Park, F. Douglas Powe Jr., Mark R. Teasdale, Kimberly D. Reisman, and Brian Yeich. 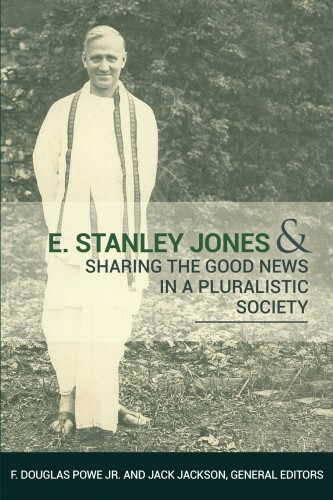 Eli Stanley Jones (1884-1973) was a Methodist missionary and theologian. He is remembered chiefly for his interreligious lectures in India, thousands of which were held across the Indian subcontinent during the first decades of the 20th century. According to his and other contemporary reports, his friendship for the cause of Indian self-determination allowed him to become a friend of leaders of the up-and-coming Indian National Congress party and spend much time with Mohandas K. Gandhi and the Nehru family. As Christians seek ways to authentically, faithfully, and genuinely share the gospel, they can find themselves pulled in two opposite directions. One forbids mentioning the name of Jesus and the other tries to forcefully lead people to confess Jesus as Savior without any regard for their social circumstances. Neither option works or is sustainable, but both do make the church irrelevant to the very people it seeks to reach. The life and thought of E. Stanley Jones offer a third way that is theologically grounded and socially attuned to the hardships many endure. This book explores why this third way must be reclaimed.